Bio-Oil Stretch Mark: Does Bio-Oil Stretch Mark Work? Bio-Oil is a lightweight body and face oil made from plant extracts and vitamins that is known as an effective treatment for stretch marks, scars, uneven skin tone, and aging skin. Using a breakthrough ingredient called PurCellin Oil, this product’s formulation changes consistency so that it is light and non-greasy and, therefore, more easily absorbed by the skin. Bio-Oil is manufactured in accordance with the current Good Manufacturing Practice as dictated by the World Health Organization. Its ingredients are tested for adulteration and microbiological contamination before production and then a sample is kept and monitored in a lab for five years. The manufacturers stress that no harmful emissions or hazardous waste or wastewater is generated in the production of Bio-Oil. Its packaging is recyclable. Bio-Oil has garnered 134 skincare awards since its 2002 launch, including several awards for best stretch mark oil or product to use during pregnancy. The prices for this product follow: $11.99 for a 2 fl. oz. bottle, $19.99 for a 4.2 fl. oz. bottle, and $27.99 for a 6.7 fl. oz. bottle. , Geraniol, Hydroxycitronellal, Hydroxyisohexyl 3-Cyclohexene Carboxaldehyde, Limonene, Linalool, and D&C Red No.17 (CI 26100). Bio-Oil combines plant-based ingredients with vitamins and a breakthrough ingredient called PurCellin Oil to deliver a very light-weight and non-greasy formula that is easily absorbed by the skin. It can be used all over the body and is known to improve the appearance of scars, stretch marks, uneven skin tone, aging, and dehydrated skin. Some of the oils that are used in this product include calendula oil, lavender oil, rosemary oil, and chamomile oil. Bio-Oil should be applied twice daily for a minimum of three months. Pregnant women should apply it from the start of the second trimester to stretch mark-prone areas, including the abdomen, breasts, lower back, hips, buttocks, and thighs. It should not be used on broken skin. This product should be stored in a cool place away from direct sunlight. 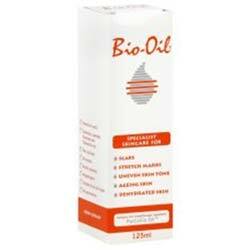 Bio-Oil is a trusted product used by many pregnant women. Its manufacturers place an importance on testing the formula to ensure it is safe for use. Although the results of clinical studies are not available on the Bio-Oil website, several positive testimonials exist on sites like Amazon.com. The price is very reasonable and this product can be purchased both online and in myriad stores. For the most part, its list of ingredients include nourishing oils that are familiar to most customers, though some may balk at the fact that it also uses mineral oil. Overall, this is a well-regarded multi-purpose body oil that holds the distinction of being both extremely moisturizing and non-greasy.